Raised in Chappaqua, New York, the home of Horace Greeley, Indra Stern-Hayworth headed west in 1972, with a BFA from Ohio Wesleyan, her friend Kat Parker, a dog, and two cats, in her baby-blue Ford van. "We had a blast," says Stern, who arrived in San Diego late that year, then discovered Eugene on a visit to the Oregon Country Fair in '73. 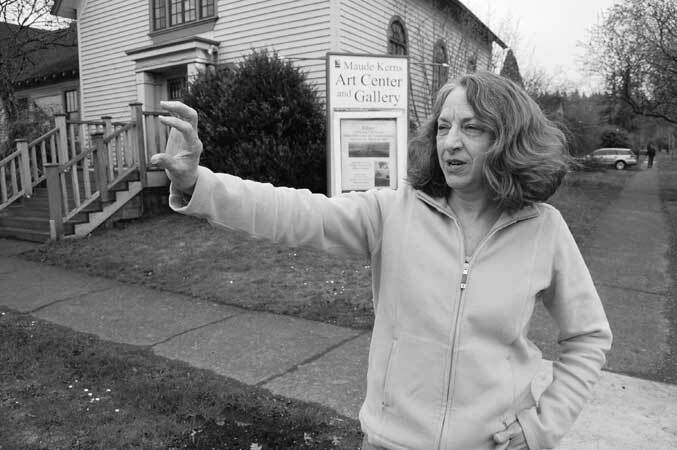 She returned in '74 and found work at Mama's Home-Fried Truck Stop, a hub of community activism that hosted meetings for the OCF and the Community Center for the Performing Arts (WOW Hall). "I was involved in initial stages of the CCPA. It's one of my proudest moments," says Stern, who also served as OCF staff from '76 to '84. She met Stan Hayworth in 1978, raised a family, and had a long career as a jewelry buyer for local stores. Stern is a founding mother of two long-lived local arts institutions, the Radar Angels performance troupe (since 1979) and the Jello Art show (since 1988). This year's Jello Art Show, on view one night only, Saturday, April 2, 5-8 pm, at the Maude Kerns Art Center, features the Radar Angels extravaganza, "A Toast to Jello," at 7 pm. "The event is tongue-in-cheek," Stern says, "but it's paramount in any community to promote the arts, to keep art alive."